YouTube seems to be competing with all the big daddy’s to survive in the super fast competition of Live Videos. By recently adding a new update for its live streaming platform, YouTube is all set to make its mark with its YouTube live on desktop feature. You can go live on YouTube without any complicated process now. This feature is going to give a tough competition to Amazon-owned rival Twitch and also to Facebook. Streamers can now add automatic live closed captions and can tag their videos with a location. This lets the viewers see other live streams happening in the same area. This recent update allows the creator to go live instantly without any hassle. Before this update, the live streaming process was a bit complicated. Before starting streaming, the user needs to prepare an encoding software. This software helps to transcode your video and audio into a format that YouTube can send it to all your viewers. People were using free software like OBS studio to generate the code. But now with this update, it has become easy and quick to go live. Currently, this update is only available in Google Chrome browser. Since the live videos are gaining the momentum these days, it has become a necessity for all the tech giants to come up with new techniques for capturing live videos. Rather, such kind of features is now a de facto thing. 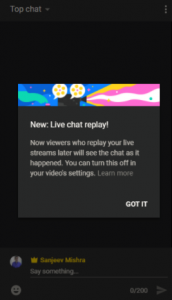 This update is surely going to encourage more users to try out the live streaming feature. Firstly if you are a user, login to the YouTube account. There you have to provide your phone number to get the verification code. The YouTube sends the code to the given number. Put that code and your account is verified. If you are an existing user, directly go to the dashboard. Once you are logged in, the dashboard will open in front of you. If you are a new user, then YouTube takes 24 hours to activate and verify the account. The dash will look like this as given in the screenshot. 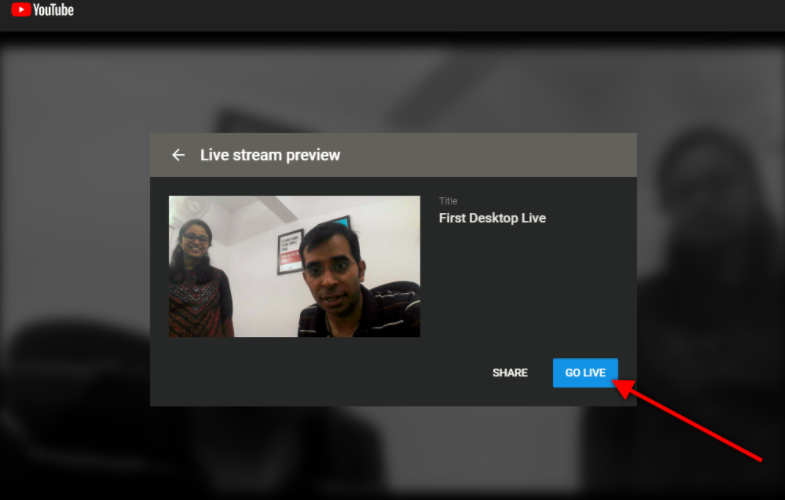 As the live streaming feature was already there on YouTube, now you will be able to see one more option of camera which is the new addition. Click on the camera to proceed to the next step. Once you click on the camera option you will see a page something like this. 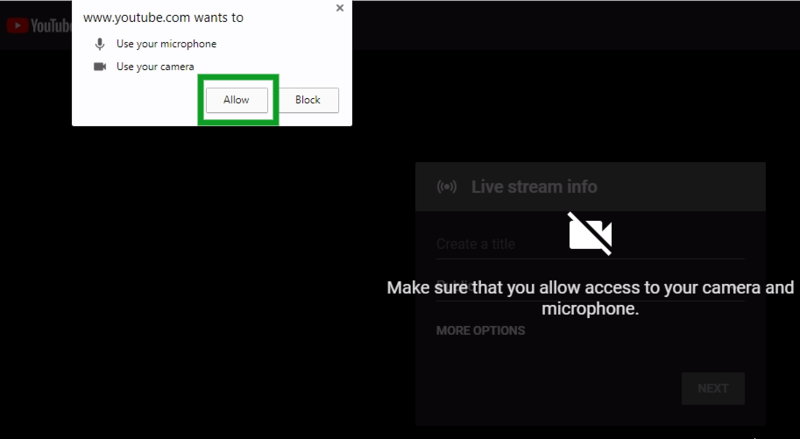 The YouTube will ask for permission to allow the camera and microphone of your system. Click on allow to proceed. Once you allow the camera, a window will open in front of you. There put the live streaming information. Add the title of the video and select the option of making it private or public. A short description can also be added to know the viewers what you will be talking about. 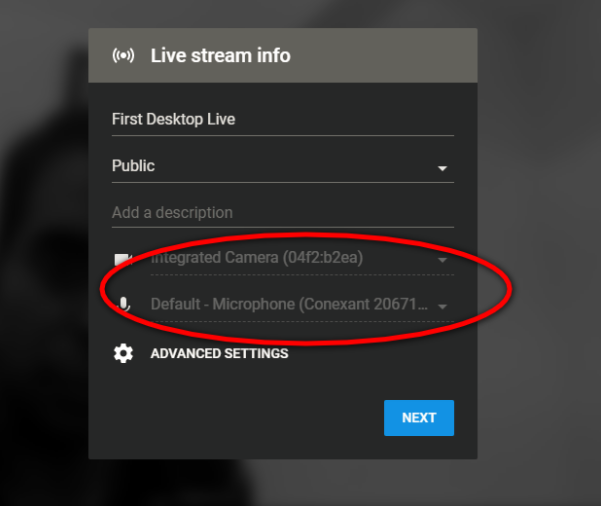 Also, you can select the camera and microphone if you have connected any other device to your system. Once you have filled everything and selected the options for camera and microphone, hit the next button. And a window like this will open in front of you. Once you have figured out everything, the final stage is to hit the button of “Go Live” and your video will start immediately. You can also set a different thumbnail for your video. The sharing option enables you to share the live streaming on all the social media sites. Also the advanced options can be used to set the age limit for the video and the monetization option. The new service called “Super Chat” allows users of the service to “get a creator’s attention” by buying a variety of emoji and chat messages which are then pinned to the top of the chat window for up to five hours. Similar to Facebook Live which has the chat corner with every streaming, Super Chat works exactly like that. This will enable the creator to personally interact with the viewers and know what they exactly feel. This is also a way through which the creator can get instant reviews. Though YouTube is into live streaming since 2011, but the consumer’s appetite has gone up due to Facebook’s live update. This is because, Facebook is used by every individual and YouTube is mainly used by artists. So now that the pace has picked up, YouTube’s strategy is definitly going to work. According to Techcrunch, the company has also scored deals with several device manufacturers including Asus, LG, Motorola, Nokia and Samsung who will add a live stream feature directly in their camera apps on select upcoming devices in the months ahead. This feature will be at ease for everyone as there will be no need to open the app, directly open the camera and select the streaming option. All of this said and done, but we have to remember one thing that the quest to finding the upper pace in this regard has just begun!